One of the most familiar names in kitchen gadgetry, SodaStream, is set to return this summer. Actually, I don’t think it really ever went away, but with a new TV advert just appearing on our screens the name is set to become a household name once again. It’s been around 20 years since SodaStream last advertised their range of fizzy drinks makers on television, and no expense has been spared on the new ad. Indeed it has an almost movie feel to it, starting with images of sad and dejected people whilst a voice over talks rather ambiguously about lost loves and things of that ilk. The advert then changes to shots of people being happy because their love is returning, and it is revealed that this love is none other than the good old SodaStream machine! That said, as you can see in the image the brand new SodaStream model looks rather more space age than the original yellow and white plastic affair that I remember having in our family kitchen. The new machines certainly look the business, and one aspect they are being sold under is that they are greener than buying bottles of fizzy pop. After all, you just use tap water to make the drink and the gas cylinder is returnable when it has expired. The thing that pleases me most though is that SodaStream have wisely decided to retain their old slogan in the new advert, so get ready to “get busy with the fizzy” once more! 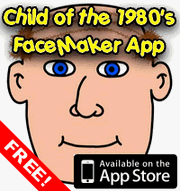 This entry is filed under Miscellaneous, TV - Adverts	and was posted on July 16th, 2010. You can follow any responses to this entry through the RSS 2.0 feed. You can leave a response, or trackback from your own site. 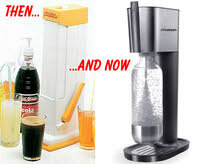 I seem to recall the SodaStream versions of drinks tended to taste more like the supermarket own brand versions of drinks, but we used to save cash and just use orange squash and the like to make pop with our machine.